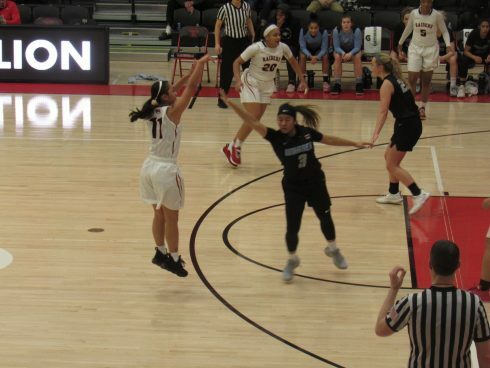 In conclusion to a rain delay, senior day doubleheader SOU earned a split, after losing a crucial game in the opener to an Eastern Oregon University team with 3 total conference wins. The Raiders fought to win the game after allowing 3 runs in a rainy first inning Sunday, April 17, then pulled out 7th and 8th inning rally’s Monday to earn the split. The game was suspended going into the bottom of the third, and continued with s score of 3-to-2, because Sierra Anderson had a two run double before a heavy rain forced a 24-hour delay to the third inning. 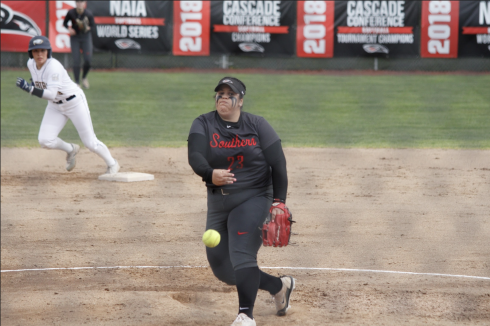 The pitchers, SOU’s Jordyn Kurtz and Eastern’s Jenn McDonnell dominated the restart and held the score at 3-to-2 into the 7th inning, when Sarah Wharton and Rayna Okimoto walked to put runners on for Kurtz who dropped a hit to left with 2 outs, tied 3-to-3. Kurtz shut down the opposition offense in the top of the 8th inning. The Southern Oregon offense went into attack mode to start the bottom half of the 8th, with Anderson lacing a single to right, Wharton shot a double to left and Katie Moy walked to set the stage with bases loaded. Don’t blink like most people did, because Sierra Anderson broke from third base on a poorly pitched ball and scored when it rolled away from the catcher. The Raiders won 4-to-3. Anderson had two hits for the Raiders, a 2 run double and scored the winning run, while Kurtz picked up her eighth victory of the year.